There was a full house in the Royal Festival Hall for American singer/songwriter Madeleine Peyroux and her band. Although in the middle of a world tour promoting her new album, Anthem, she and the band seemed fresh and cheerful. I was expecting lots of songs from Anthem, named after a favourite song by Leonard Cohen, and there were quite a few. Peyroux and her band also played a broad selection of tunes from her extensive back catalogue of the last 20 or so years, which pleased the fans. It always feels very comfortable listening to Peyroux. She appears relaxed on stage, and comes across as pleasant and good humoured, with the audience and with her band. The music is easy to like too – her fantastic band turn their hands and voices to a variety of styles, all played with precision and seeming effortlessness. After announcing that there would be plenty of love songs, she kicked off with Don’t Wait Too Long, an original composition from her 2004 hit album Careless Love. The band played immaculately from the first note, and that lovely Peyroux voice is as gorgeous as ever. Next came a gently swinging arrangement of Bob Dylan’s You’re Gonna Make Me Lonesome When You Go, then a fabulously languorous version of Serge Gainsborough’s La Javanaise, used in the soundtrack of last year’s film sensation The Shape of Water. Then came a section of the new songs, beginning with a jaunty tune called On My Own. 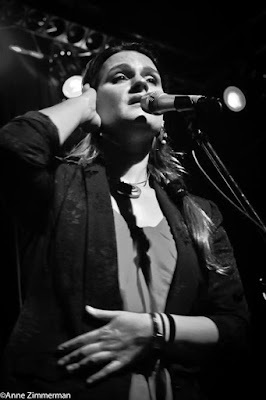 Peyroux started out as an interpreter of other people’s songs, but has been composing more and more over the years, usually in collaboration. All the songs on Anthem, apart from the Leonard Cohen title cover, are composed by the members of the group who play on the CD. “It’s a collaborative record”, says Peyroux. The mood changed with a song about the current state of the USA called The Brand New Deal. It was like a Gil Scott Heron piece arranged by Steely Dan. The chorus goes: “Feel the poor under your heel, it’s a brand new deal”. The song ends with a long and sombre list “…disinformation, discrimination, under-education, de facto segregation…”, the guitar keens, there’s a short wild piano solo, and driving bass and insistent drums, tumbling downwards, to the final discordant finish on the words “Mass incarceration”. Blimey! After that showstopper was the affecting Lullaby about a woman singing to her baby which I think was about refugees fleeing by boat. The rhythm section created a rolling seascape, the guitar called out and there was a relentless onward thrust. As Peyroux sang, her voice went from soothing lullaby to an almost harsh desperate tone as she sang “baby please don’t cry, I’ll sing it with you until I die, baby please don’t cry”. On one refrain she breathed/sang “baby please don’t die”, to heart-breaking effect. After that, Peyroux said “why don’t I do something more cheerful? ", and the audience seemed to think it was a good idea too. We heard On A Sunday Afternoon, apparently popular with “stoners”, full of witty musical references and a suggestion of Woody Woodpecker, and then the charming toe-tapper Honey Party. The all-American band are a completely different set of players from those on Anthem. On lead guitar was Jon Herington, known for his work with Steely Dan – his precise and interesting solos embroidered many of the songs. On electric bass Paul Frazier, best known for his work with David Byrne, played only one solo all night but he brought versatility and funkiness which underpinned the whole show. On drums was Graham Hawthorne who has toured with Paul Simon and Randy Brecker among others – he plays in a marvellously discreet way, apart from his compelling contributions to the two political songs, and a mesmeric martial drumming throughout the Leonard Cohen cover Anthem. The keyboardist, Andy Ezrin, had lots of effects up his sleeves throughout the show. I particularly enjoyed his solo on the light and lovely bossa nova Honey Party, when he managed to slip in quite a lot of The Flight Of The Bumblebee. Peyroux herself is a fine guitar player, and she played for most of the set. There was an acoustic interlude when the band left the stage and she played us some solo blues and spirituals, including Bessie Smith’s Don’t Cry Baby and Trampin’. She is so good at singing the blues. You can still hear that Billie Holliday influence in her phrasing, and the way she slides up to and down from notes, but her strong tuneful sound, and that honeyed timbre is very much her own. She also sang Josephine Baker’s J’ai Deux Amours, in her perfect French. The band came back on and we had terrific versions of Allen Toussaint’s Everything I Do Gonna Be Funky From Now On with all five musicians singing the chorus in harmony whilst still playing away, a fantastic effect – one of the highlights of the night. After another Cohen number Dance Me To The End Of Love, with Peyroux purring out the lyrics over a hot club-esque quartet with restrained guitar and piano solos, and hints of Love For Sale in the vocal line, the audience cheered. The band launched into the final number, We Might As Well Dance from the new album, another upbeat sounding but ruefully worded number, “We might as well dance, we’ll be leaving soon,” and we were invited to clap along. After a standing ovation, the band came back and played for me the best piece in the show, a great arrangement of the Billie Holiday hit Getting Some Fun Out Of Life. It’s a wonderful song, a lovely sentiment, which sat perfectly with the tone of the whole show, and everyone on stage shone. Ezron’s piano work here was somehow redolent of New York in the 1940s, though fresh and new. Herington’s guitar solo, though suggestive of bebop, was his own interesting take. Frazier and Hawthorne were allotted a little space for themselves to show off their understated graceful rhythm thing, and Peyroux’s peerless voice was showcased flawlessly. I couldn’t have asked for more from this splendid band. Fantastically worded review! I'm curious to know however, who also was her supporting act? There's usually a talented startup before such greats as Madeleine Peyroux.